26% rate their lives well enough to be "thriving"
For International Women's Day on Sunday, Gallup looks at how women around the world rate their lives and their daily experiences. WASHINGTON, D.C. -- While International Women's Day this Sunday will focus mostly on how the world thinks women are doing, it's important to understand how the women of the world think they are doing. The best way to find this out is to ask them. This International Women's Day, more than one in four women worldwide -- or about 620 million women -- rate their lives positively enough to be considered "thriving." The life ratings of the rest -- or about 2 billion women -- place them in a category of "struggling" or "suffering." These ratings have been remarkably stable for the past several years. Since 2005, Gallup has conducted nationally representative surveys in more than 160 countries asking women (and men) to evaluate their current and future lives on a ladder scale with steps numbered from 0 to 10, based on the Cantril Self-Anchoring Striving Scale. Gallup classifies them as either "thriving," "struggling" or "suffering." People are considered thriving if they rate their current lives a 7 or higher and their lives in five years an 8 or higher. The countries where the highest percentages of women are thriving tend to be primarily wealthy, developed countries. Iceland and Sweden have the highest percentages in the world. Many of these countries also score well on the U.N.'s Human Development Index, suggesting that what makes women's lives better makes people's lives better in general. For example, in Sweden, where three in four women are thriving, the employment rate for women is among the highest in the world. The countries where women rate their lives the worst tend to be experiencing instability, such as Afghanistan, where coincidentally no women rate their lives positively enough to be considered thriving. Women in economically devastated Greece and Ukraine are also more than twice as likely to be suffering than the global average. While the majority of women worldwide fall into the struggling or suffering category, based on their life evaluations, only 20% to 35% worldwide say they experienced a lot of negative emotions -- stress, sadness, physical pain, worry and anger -- the day before the interview. 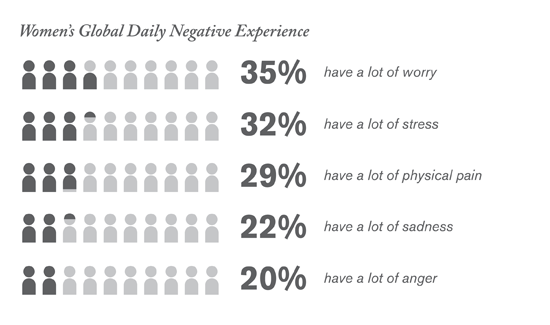 Again, in countries where there is considerable instability -- militarily, economically or politically -- women are more likely to report experiencing negative emotions. Women in war-torn Iraq, for example, have the highest Negative Experience Index scores of all women in the world. The countries reporting the lowest negative emotions are former Soviet Union countries, which does not mean that they report high positive emotions; instead, these countries typically report low emotions overall. Despite the tough conditions in so many countries around the world, most women are still finding a way to live their lives well. 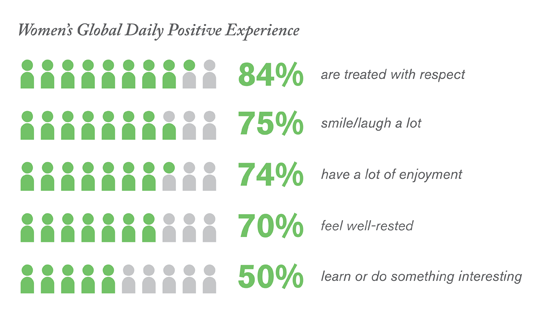 At least 70% of women worldwide say they were treated with a great deal of respect, smiled or laughed a lot, experienced enjoyment or felt well-rested the day before the survey. Furthermore, 50% of women say they learned or did something interesting the day before the interview. Women are most likely to say they had these positive experiences in Latin American countries, where nine of the top 10 countries in the world for positive experiences are located. 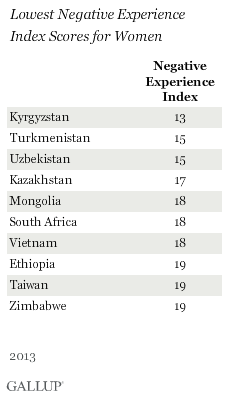 Women in Syria have the lowest Positive Experience Index score -- an all-time low for any country Gallup has measured. How women view their lives varies a great deal by the relative wealth, development and stability of the countries they live in. But the two largest areas where all women's lives can improve are jobs and personal safety. The global workforce consists of 50% more men than women, and men are almost twice as likely to be employed full time for an employer. Encouraging women's participation -- particularly in emerging markets where gender gaps are widest -- not only can improve how women are doing, but also can fuel economic growth in their countries. Perhaps even more important is that women are less likely than men to feel safe in the cities or areas where they live. Gallup's macro-level well-being model for societies suggests that safety and security is the foundation of a great society -- an improvement here would pay well-being dividends not just for women, but for the society as a whole. But while significant gender gaps exist in these two areas, as well as a number of others, there is remarkable parity in how women and men rate their lives. This is true with thriving, struggling, suffering, negative experiences and positive experiences. The most positive finding from these data is that most women experience a great deal of positive emotions on any given day. However, only 50% of women worldwide report experiencing one of those positive emotions -- learning and doing something interesting -- each day. These data emphasize the importance of the U.N.'s Sustainable Development Goals of ensuring inclusive and equitable quality education and promoting lifelong learning opportunities for all. Gallup will continue to monitor how women are doing worldwide through the best way we know how, which starts with asking women. The most recent results for 2013 are based on telephone and face-to-face interviews with 125,839 adults, aged 15 and older, conducted in 2013 in 136 countries and areas. This sample includes 66,313 women. For results based on the total global sample, one can say with 95% confidence that the margin of sampling error is less than ±1 percentage point. For results based on country-level samples, the margin of error ranges from a low of ±1.7 percentage points to a high of ±4.2 percentage points. The margin of error reflects the influence of data weighting. In addition to sampling error, question wording and practical difficulties in conducting surveys can introduce error or bias into the findings of public opinion polls. All reported margins of sampling error include computed design effects for weighting. Learn more about how the Gallup World Poll works. The data in this article were generated from Gallup Analytics. For complete data sets or custom research from the more than 150 countries Gallup continually surveys, please contact us. 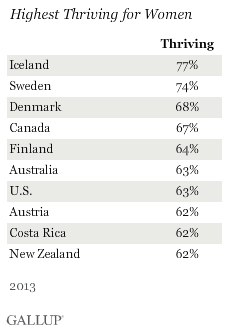 69% of adults worldwide have confidence in their local police. 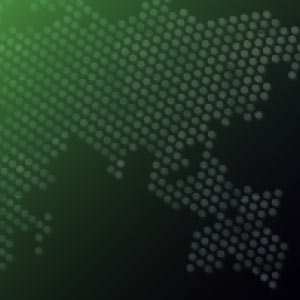 In every corner of the Earth, the Gallup World Poll tracks the opinions that matter most. The global jobs outlook remained dismal in 2013, and it was even more so for women than for men in some parts of the world, such as Northern America and Latin America and the Caribbean, where women were more pessimistic than men about job prospects. In every region of the world, men continued to do better in 2013 than women when it comes to having full-time work for an employer. The Payroll to Population rate for women is 50% or higher in only two countries, Sweden and Iceland. This Fourth of July, nearly nine in 10 Americans are satisfied with their freedom.